Everything to know about bubbles for your big day! Weekends, especially in the spring and summer, often book 3-6 months in advance. If we are already booked on your requested date, we can talk about other options (including booking later in the day or providing an alternate bubbler). Reserve your date today! We take cash or check for the full amount, on the day of your performance. Tips are gratefully accepted, but never required. Can you give me a quote for one hour instead of 90 minutes? We’re happy to reduce the amount of bubbling time if you have a tight schedule, but the costs are the same. Behind every performance are additional costs: making bubble juice, travel, packing/unpacking, and wand maintenance, so all pricing is based on a minimum of 90 minutes. What’s the best way to time my event? For kids’ birthday parties, we like to start bubbling right at the party’s start time, so kids arrive and can jump right into an activity. 90 minutes of bubble fun gets everyone to the perfect place for singing happy birthday and having cake. We’re happy to work with you to design the perfect bubble accompaniment to any event. Give us some details about what you have in mind and let’s talk about it! Do you do indoor shows? My new indoor bubble show launches December, 2018! I am also accomplished in several circus arts, including magic and juggling. I can also recommend additional circus performers, face painters, and entertainers to make your event shine! What kind of bubble juice do you use? We custom-make all of the juice for your event. Our performance juice is from a recipe known in bubble land as Brian’s Competition Mix. Our kid station juice is a simpler version with fewer ingredients. We support the open-source spirit in bubbling—if you’d like to get into it yourself, start with the Soap Bubble Wiki. Is bubble juice harmful to grass? Anything can be harmful to grass in large enough amounts, but we take care to use non-toxic ingredients. More importantly, to absolutely minimize the amount of juice that enters the soil. The most problematic ingredient in high-performance bubble juices seems to be glycerin, so our performance juice contains only 30 grams of glycerin in every gallon of juice. Our bubble station juice contains no glycerin at all. What kind of bubbles will you make? 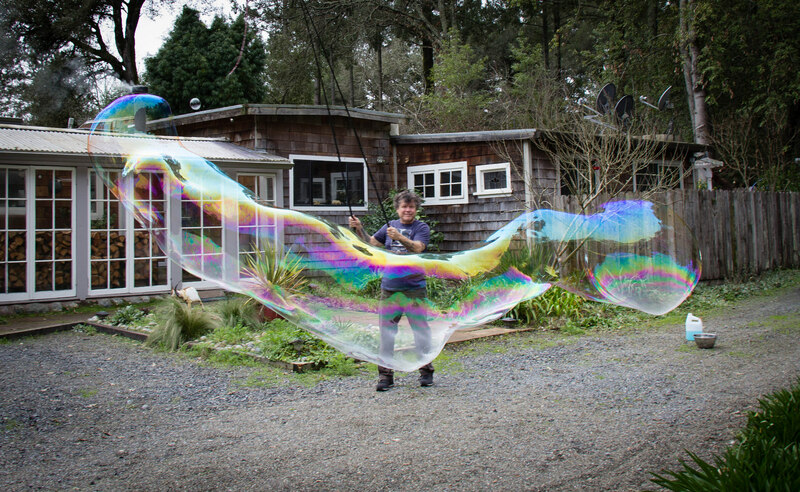 I make a variety of bubbles, from super giants to big masses of smaller bubbles—I might even show you some fun foams! The kind of bubbles I make for your show will depend on my bubble partners: the wind, sun, and humidity. For giant bubbles, the best conditions are very humid, with just a slight wind and cool conditions. My bubble performances are always tuned to the conditions and landscape we are in! Fun making a giant bubble. Can we make bubbles, too? We custom-make all of our bubble equipment, and some of it is very large and requires some practice to use. If you’d like to make bubbles yourself, be sure to ask us about “Bubble Stations”—we’ll bring everything so that all of your guests can make some spectacular bubbles with user-friendly bubble wands. Bubble stations provide a way for your guests to make their own giant bubbles. We bring everything needed!